You are here: Home / Services / Singapore Accounting Services / What is XBRL? Starting 2 December 2013, almost all companies will need to file their financial statements in XBRL via new BizFinx system. Rikvin can help your company file your financial statements in XBRL with the Accounting and Corporate Regulatory Authority of Singapore (ACRA). XBRL (Extensible Business Reporting Language) is a language for the electronic communication of business and financial data worldwide. XBRL is an open-source software that enables the organization and management of financial data for research and analysis. It also facilitates the communication of financial information online and amongst businesses with significant accuracy and reliability. ACRA has adopted XBRL as part of its overall strategy to streamline financial reporting and to enable the flow of financial information to the international business community, thus promoting a pro-enterprise environment. Who needs to file in XBRL and who is exempted? 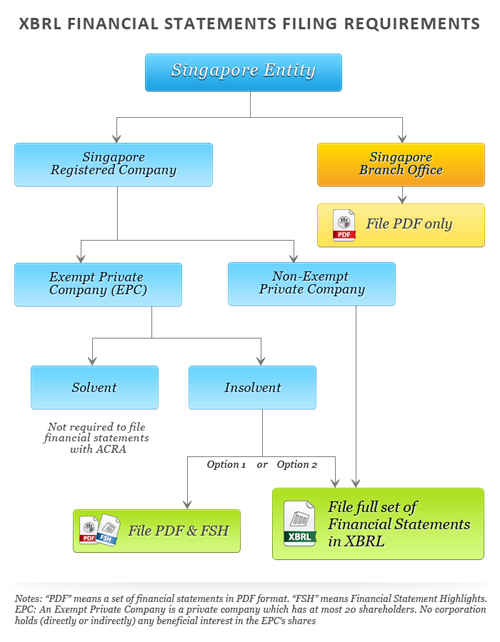 With effect from 2 December 2013, Singapore companies which are either unlimited or limited by shares will be required to file a full set of financial statements in XBRL format, according to a minimum requirement list within the new ACRA Taxonomy 2013. The filing of Option B (Partial XBRL) will no longer be available. Those allowed by law to prepare accounts in accordance with accounting standards other than SFRS, SFRS for Small Entities and IFRS (International Financial Reporting Standards). The revised XBRL filing requirement will apply to companies if they are filing financial statements with periods ending on or after 30 April 2007. Companies filing financial statements relating to financial periods ending before 30 April 2007 will continue to file their financial statements in PDF format and their financial highlights in respect of the financial statements in their Annual Return (AR). The minimum requirement list is a set of elements within ACRA Taxonomy 2013 which requires companies to file if the information is available in the financial statements. Companies may choose to submit more information in XBRL format than the minimum requirement list. The minimum requirement list is designed on a needs-driven basis, which means elements are only included for collection if they are sought after by consumers of financial information. A comprehensive cost-benefit analysis weighing the interests of all stakeholders was conducted before the minimum requirement list was derived. detailed information elements to allow companies to submit information within individual sections of the financial statements. Note 1: Preparers are required to submit the complete information or breakdown in accordance to the Minimum Requirement List for the section. Concepts for “others” may be available to facilitate the disclosure of full information or breakdown. Note 2: Only selected elements are included in the Minimum Requirement List. Hence the completed elements do not have to sum up. Note 3: Preparers are not required to provide the breakdown of the trade and other receivables, trade and other payables and provisions according to different classes of parties. Note 4: In contrast to note 3, preparers are required to provide the breakdown into different classes for property, plant and equipment, and share capital. Please note that the applicability of each section listed above for submission will depend on the set of financial statements and the disclosures within. ACRA advises preparers to understand their financial statements to determine the relevant sections for submission in order to facilitate more efficient preparation. * Applicable for companies not exempted from audit requirements. Need assistance with your XBRL Filings? XBRL filing can be a time-consuming and daunting process for many companies. At Rikvin, our professional accounting team can assist you with the preparation of financial statements in the XBRL format proficiently and cost-effectively. If you are interested in learning more about our XBRL service, please contact us or give us a call at +65 6320 1888.